Q: Why are synchronous motors used for the large pumps in my facility but not small pumps? A: A type of electric motor used in pumping applications is synchronous. As the name suggests, the rotation of the shaft is synchronized with the frequency of the supply current. This is different than the most common pump driver, which is the induction motor that has a shaft that rotates at a speed less than the synchronous pole speed. Synchronous motors have a unique and merited position as the most efficient electrical drive in the industry for slow speed applications. 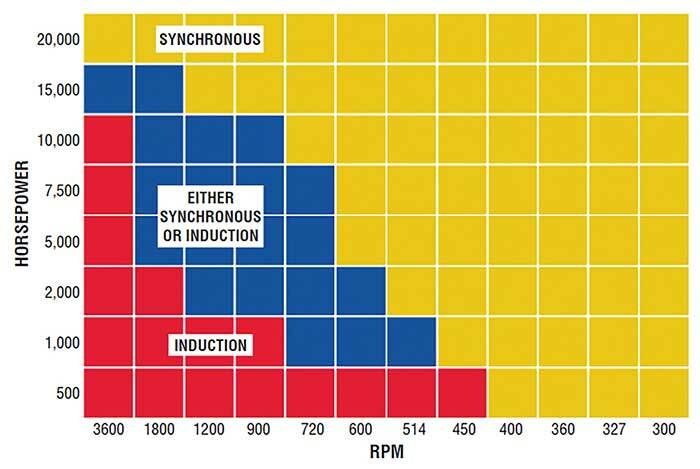 As shown in Image 3, synchronous motors can be applied over a wide range of power and speed but are the preferred driver for low speed and high horsepower applications. They perform with great economy while converting electrical power to mechanical power. For more information, refer to the newly published guidebook “Pump System Optimization: A Guide for Improved Energy Efficiency, Reliability, and Profitability” at www.pumps.org.